I stayed at a hotel and woke around 3 am feeling like my body was on fire and itching. So, I went back to bed thinking the Benadryl would help. I woke in the morning in an unbelievable amount of discomfort due to over 40 Small red spots! It was horrific and unbearable! I went to the ER and was told it was scabies and to wash all all my sheets. The next morning I woke with over 100 bites and immediately returned to the ER. It was then determined it was bed bug bites. Long story short, the hotel had been aware the room was infested, it doesn't have to be a dirty hotel, but still placed me in the room. I sued, I lost everything I owned because they can only be killed by extremely high levels of heat and most of my stuff couldn't fit into a dryer for 40 mins, plus I wanted no chance of taking a single bed bug with me. It was one of the worst experiences I have ever endured. Nothing seemed to ease the pain. I felt completely disgusting! 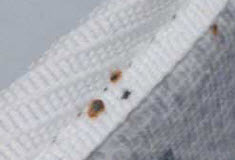 It's hard to know there are bed bugs unless you really, really look. They are tiny and only come out at night. Best of luck and hope you have speedy recover, if you ever have to go through this. The bites can leave scars as well. Thanks for sharing your story. Everyone should inspect hotel rooms before unpacking any luggage. When I enter a hotel room I start by peeling back the sheets on a corner of each mattress. If the mattress is not 100% clean, I change rooms and ask about any bed bug infestations in the hotel. You can also double check the areas around the head boards. The picture attached above shows you what to look for regarding mattress stains.